Winsted Public Library | Book Your Winter Getaway with the Winsted Winter 2016 Reading Program! 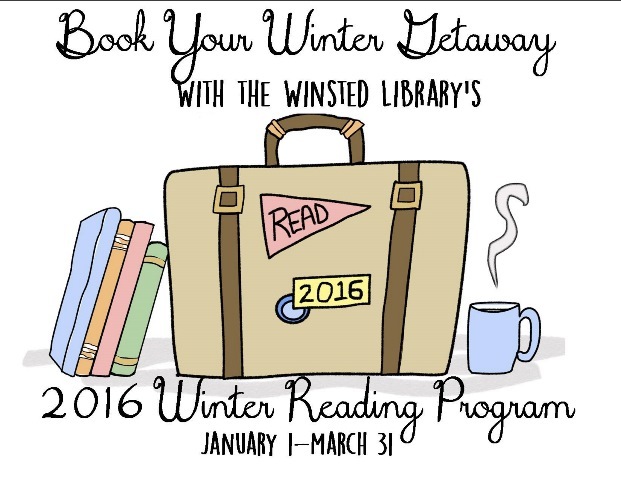 Book Your Winter Getaway with the Winsted Winter 2016 Reading Program! Are you ready to get away from this cold weather? The 2016 Winter Reading Program is almost here! Reading logs will be available starting Monday, December 28th at the front desk, just in time to help you Book Your Winter Getaway from January 1st to March 31st. This Winter, we’re also offering a new program series for ages 16+ to help beat the Winter Blues! 4 Players max on a team. Gather a team of 2-4 players, and get ready to do a battle of the brains starting March 1st during our month-long Trivia Tournament Tuesdays! 1 grand prize for the overall tournament winner will be awarded at the end of the month. Doors open at 5:30, and the questions start at 6pm. Don’t have a team? Come anyway, and we’ll find you one, or just come and watch the fun! Registration is needed for this event. $20/team for entire tournament. One time use Round-Doublers will be available for $5 purchase 1st night of Tournament. You can register your team by calling the Winsted Library at (320) 485-3909, by email at winsted.staff@pioneerland.lib.mn.us , or by stopping in at the library during library hours. For ages 16+. March 1, 8, 15, 22, & 29.
at the Library is made of! 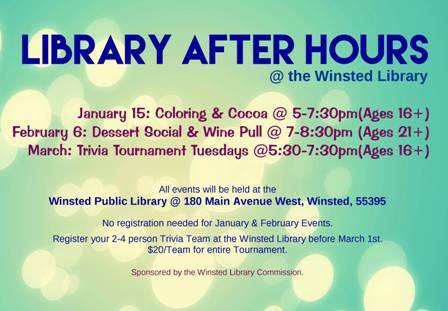 come to the Winsted Library for an evening of sweet fun & conversation. There will be a smorgasbord of locally made desserts to sample, a wine pull for $10 a bottle, a game of Heads & Tails, & even a Kissing (Photo) Booth for you and your Valentine to take pictures in! No pre-registration is needed for this event. For ages 21+. When was the last time you colored a picture just for fun? Your last name doesn’t need to be Picasso or Van Gogh to come join in the coloring fun! We’ll provide the coloring sheets and coloring supplies (or you can bring your own), along with some hot chocolate, apple cider, or coffee for this evening’s event. No pre-registration is needed for this event. For ages 16+. « Are You Ready for Storytime?